Zombie movies and cartoons have become a hit with both adults and kids alike. No longer are zombies just a boring trope in a scary movie, now they are taking center stage in both movies and television shows. Whether your child loves the classic movie zombies or the modern, more human-like zombies, they will love dressing up as a zombie this Halloween. Kids zombie costumes come in all sizes and styles and this Kids Living Dead Zombie Costume is the perfect mix of the classic and modern zombie look. 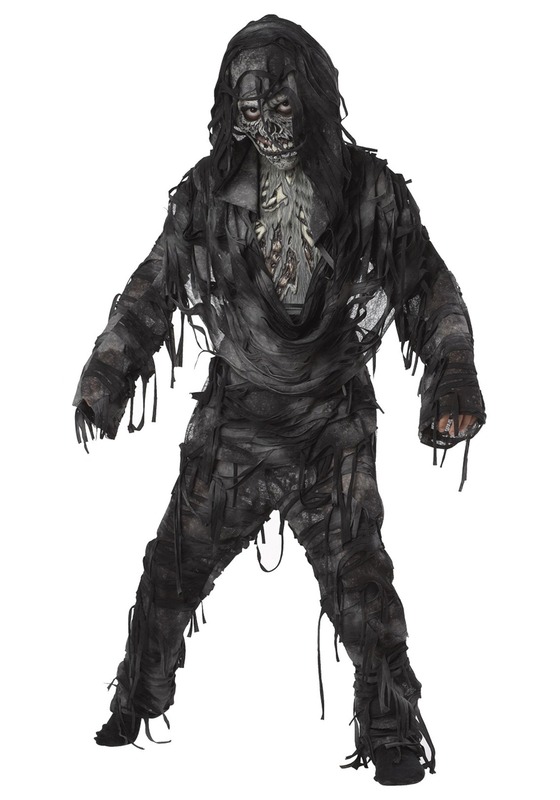 This costume comes complete with all of the gruesome details you’d expect from a classic zombie costume, but with enough modern comforts that they can move around easily on all of their Halloween adventures. This kid’s zombie costume is a shirt and pants combo. The pants have an elastic waist for a comfortable fit and the top and pants have matching gray and black poly blend fabric. The molded chest piece attaches with Velcro at the shoulders and gives the costumes it’s from-the-grave look. Finally, the molded vinyl mask has slits for the eyes for clear vision and is held in place with an elastic strap. The gory details truly set this full zombie costume apart from the others. Add black boots and gloves to complete the look. Your child will look like they just emerged from the crypt with this realistic costume. No need for any zombie makeup – this costume and mask combo has your child covered this Halloween or for a fun night out in the neighborhood! Using the costume for a dance recital, minus the mask. The boys were so thrilled that they were ready for Zombie Land any day of the week. By 9 and 11 year olds both wore this. The pants and shirt are really comfortable and allow long johns underneath. The rubber chest plate doesn't stay on too well, and the mask is fairly uncomfortable as it makes seeing and breathing hard. The kids were ok with ditching those and pulling the hood over their heads. For the costume maker, skip the mask and chest plate, and add a long, scraggly wig and some grey and black face make-up. Costume was everything and more than what was expected. Grandson was extrememly happy putting this costume on. Great job. The best I ´ve seen, and the size was perfect. Really creepy. My 12 year old loved it! Nice quality ( for being 'tattered) and held up very well. Mask was a little big, and smelled very plastic-y but overall very pleased!